One of the most common problems of our patients is tooth decay that when left untreated can lead to more serious problems like abscess or even losing a tooth. To treat a cavity, we remove the decayed portion of your tooth and using composite fillings, we effectively seal the area so further tooth decay is prevented. At Samaritan International, we only use white resin composite fillings that match the color of your teeth. 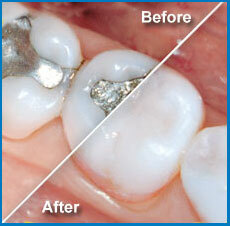 We also use ultra-violet lamp to harden the filling and ensure that it won’t easily come off. If you currently have mercury or amalgam fillings, which are proven to be dangerous, we can also remove them for you and replace them with composite fillings which are considered to be highly safe. Composites, unlike amalgams, are made of a mixture of ceramics and plastic. Because of this, they have a more natural color (they even appear invincible when applied to your teeth) making them popular choice for many patients. The use of composite fillings depend on several factors including patient’s preference, the size of the area the needs to be filled, the allergies that the patient might have, and the location of the affected area. Depending on the size that needs filling, we charge $55 to $75 per tooth.